Daily average prices in the five largest cities (Sydney, Melbourne, Brisbane, Adelaide and Perth) peaked at 159.9 cents per litre (cpl) in late October, levels that had not been reached in Australia since mid-2008. By the end of November, however, prices had decreased by more than 30 cpl to 128.5 cpl. Significant fluctuations in the price of crude oil have been the primary contributor to the dramatic swings in petrol prices in recent months. The weakening Australian dollar also increased the wholesale price for petrol, further compounding drivers’ bowser pain in September and October. “Huge spikes in crude oil prices in September and October hit drivers hard, with petrol prices soaring to ten-year highs. This unfortunately shows how we are captive to decisions made by the OPEC cartel,” ACCC Chair Rod Sims said. Crude oil prices surged between July and October due to production cuts by the OPEC cartel and other crude oil producing nations, like Russia. US sanctions against Iran, the political and economic crisis in Venezuela, and decreasing US crude oil inventories also played a role. Crude oil prices then fell substantially during November, due to concerns over a global trade war and increasing US shale oil production. “Large price variations in the petrol market are very frustrating for motorists. Our advice is to keep an eye on the price cycles information to figure out the best time to buy, and use petrol websites and apps to find the cheapest petrol stations in your area,” Mr Sims said. Information about price cycles is available on the ACCC’s website, including tips on when to buy petrol, depending on where the cycle is currently at. “Prices in Sydney, Melbourne, Brisbane and Adelaide are currently heading down towards the bottom of the price cycle. Drivers, if they can, should delay filling up until closer to Christmas. We do not expect prices in these cities to increase until later in December,” Mr Sims said. “If you live outside the five largest cities, you can still use fuel price websites and apps to find the cheapest petrol stations in your town,” Mr Sims said. In the September quarter 2018, average retail petrol prices across the five largest cities were 146.7 cpl, an increase of 1.5 cpl from the previous quarter. Average gross indicative retail differences (GIRDs) in the five largest cities decreased to 10.4 cpl in the quarter. GIRDs are the difference between average retail prices and average wholesale prices, and are a broad indicator of gross retail margins. Retail prices in Brisbane remained the highest of the five largest cities. The average retail petrol price in Brisbane in the quarter was 148.8 cpl, which was 2.6 cpl higher than the average across the other four largest cities. In the three other capital cities (Canberra, Hobart and Darwin), prices were always higher than in the five largest cities. The average differential between petrol prices in regional locations monitored by the ACCC and the five largest cities was 6.4 cpl. This was 1.5 cpl higher than in the June quarter 2018. In the September quarter 2018, diesel and automotive LPG prices in the five largest cities increased. Average retail diesel prices were 154.6 cpl, and automotive LPG prices were 85.2 cpl in the quarter. The relevant international benchmark price for refined petrol in Australia is Mogas 95. 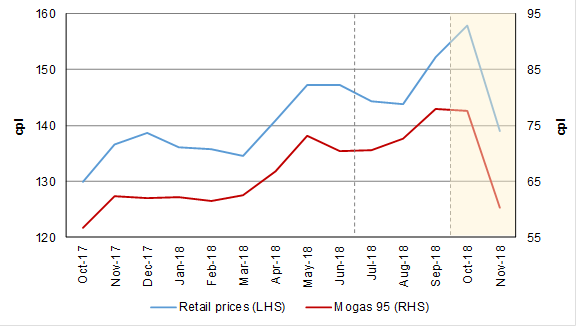 The following chart shows monthly average retail petrol prices in the five largest cities and Mogas 95 prices in Australian cents per litre. Monthly average retail petrol prices in the five largest cities and Mogas 95 prices: October 2017 to November 2018. Source: ACCC calculations based on data from FUELtrac, Platts, OPIS and the Reserve Bank of Australia (RBA). Notes: The area between the dotted vertical lines represents the September quarter 2018. The shaded area represents the period after the September quarter 2018. On 20 December 2017, the Treasurer issued a new Direction to the ACCC to monitor the prices, costs and profits relating to the supply of petroleum products and related services in the petroleum industry in Australia. Under the new Direction, the ACCC produces quarterly petrol monitoring reports focusing on price movements in the capital cities and over 190 regional locations across Australia. It also produces industry reports that focus on particular aspects of consumer interest in the fuel market in relation to prices, costs and profits. Today’s report was the fourth quarterly report published under the Direction.